But look at one of them more closely: She may be long divorced, her grown children busy carving out their lives and careers elsewhere; since the mass layoff at her work several years ago, she’s answered every possible want-ad but has received no responses; her nest egg, such at it was, is close to depleted; she cuts her own hair, shops for “new” clothes at Goodwill, never sees the dentist, thinks she might qualify for food stamps but is too proud to apply, sold her car some time ago and now navigates the city bus system; her rent is months overdue, and she’s terrified of being evicted. If you were to greet her on the street, she’d seem cheerful and “normal” enough; but if you were to look closer, you’d see in her eyes that faking normal is doing her in. That book, Fifty-Five, Unemployed, and Faking Normal, was published late last year and was recently featured in a two-part series on the PBS News Hour hosted by economics correspondent Paul Solman. In our blame-the-victim society, it’s easy for people to dismiss those who fall on hard times as having failed in some way: failed to get a good education, failed to work hard enough, failed to climb the ladder high enough… But as White makes clear in her PBS interview, these harsh judgments don’t apply to her and millions of others. As she told Paul Solman, “I have a bachelor’s from Oberlin. I have a master’s in international studies from Johns Hopkins, and I have a Harvard MBA.” When the World Bank recruited 5,000 people, they took two Americans out of twenty-five. White was one of those two Americans. Most recently, she was the chief operating officer of a nonprofit organization focused on development aid for Africa. White’s book, though, is hardly written from a place of self-pity or doom and gloom. Instead, it is a thoughtful, heartful, soulful, thoroughly researched and immensely helpful how-to for anyone acquainted with these very real financial issues or concerned they one day might be. Throughout, White’s writerly voice is calm, down-to-earth, and encouraging, as if she’s sitting right beside you, sharing coffee. She includes other voices as well — short quotes from the many interviews she did along the way – that add to the chorus. She also provides lists of hundreds of helpful websites, such as for government programs (which, we can only hope, won’t get cut by the new administration), nongovernmental organizations offering support, and freelance opportunities. She gives guidelines, too, for forming what she calls “Resilience Circles” — support groups for those going through the same circumstances. Full disclosure: I am one of five people whom Elizabeth White interviewed in-depth for her book. She wanted to know what made me emigrate to Mexico after retirement (tired of faking normal) and what I thought of my new, ex-pat life here in San Miguel de Allende. Most WOW blog readers know at least parts of my story; but to have it all, please be sure to get White’s excellent book (available from Amazon.com). Thanks for opening N important conversation rarely heard. Great piece, Bonnie. I just checked out her book on Amazon. Has a very interesting T of C. Women are essentially disadvantaged financially at every turn because of their gender: 1) menstruation and the cost of its products, 2) pregnancy and its expenses, 3) childbearing and rearing and their expenses, 4) time off work to care for children and parents without earning an income and also diminishing the amount contributed to Social Security, 5) earning 75-80 cents for every dollar earned by a man, which equates to 6) 20-25 percent lower earnings in Social Security. It’s no wonder there are so many female ex-pats living abroad. Their male counterparts can afford to stay in the USA, but they can’t. Republicans in power want to make it even harder for poorer women by denying them any help to offset expenses in birth control. Which means without access to birth control and abortion, there will be births, which will condemn many a woman to a life of poverty. But that’s a whole different subject on the same theme. Thank you so much for this valuable breakdown, Barb. So true. So sadly true, still. I’m thankful I’m not a younger woman living in the U.S.A. today. It is not only those who find themselves unemployed that are terrified, I am now 70 years old and for 25 years, have been an educator in one of the richest states in the USA. We do not receive social security but rather pay heavily into our pension program with the promise that it will be there for all of us. However, in order to get a livable pension one must work for 37 and 1/2 years.That would put me at 83 years old. I reached the top of my modest pay scale long ago and have not had a raise in years, in fact every year my take home pay has been painfully reduced by rising healthcare costs and an enormously growing out of pocket deductible. While my salary has gone down, three weeks of teaching time and professional responsibilities have been added without compensation. Now our state is crying poverty and state workers have had to accept give backs on their pension. Fire fighters and police are next and we are not far behind.This is terrifying to me because, on paper, I will never qualify for any programs or assistance. Teaching was not my first choice, I would have much preferred to go into my studio and make art, but I became a single mom with two kids heading toward college and it seemed the grownup thing to do. My one wish after meeting the responsibilities of parenthood, was that choosing to teach full time would allow me to be financially solvent enough to enter my elder years with dignity. To live without fear of how to pay for my rent, nursing home or hospice care when the time comes so that I would not be a burden to my children and extended family. I no longer see that as a possibility and it leaves me in despair. There are millions of Baby Boomers who have remained employed long after they would choose to do so for this reason. We do not retire because we cannot afford too and that trickles down to far less positions available to those just entering the workforce. Thank you for so generously sharing your story, Barbara. I can totally identify. I was an adjunct instructor at the university level for ten years before retiring (and moving to Mexico last year), earning what amounted to $9 an hour, without benefits. 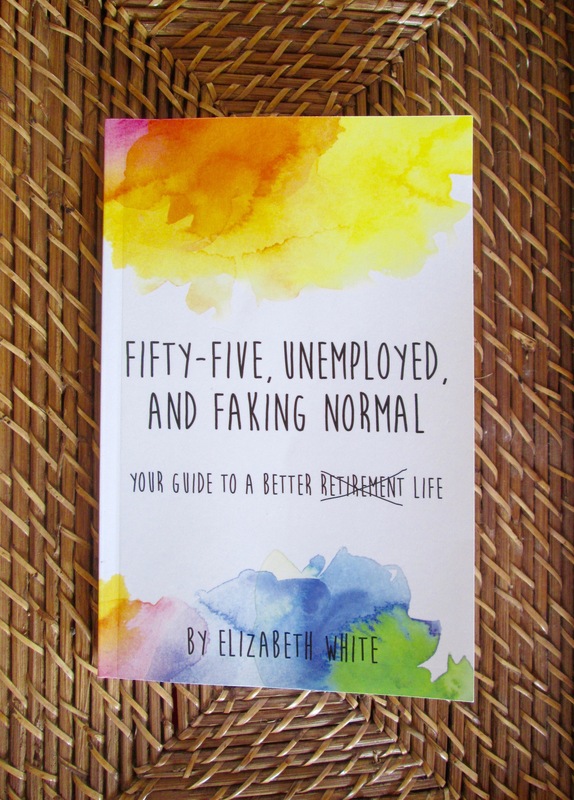 I think Elizabeth White’s book would be immensely beneficial to every older person at or near or even beyond retirement age, whether still working or not. I highly recommend it. In my view, it’s an inspired book, a godsend, an antidote to despair. 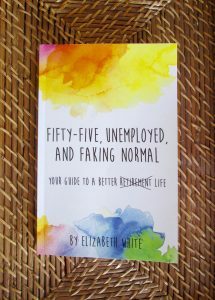 Elizabeth here, author of Fifty-five, Unemployed and Faking Normal. Thank you Bonnie for this great review and endorsement. Thank you all for your very candid sharing. It is so important that we get our stories out there to counter act all these beaming boomer, accountant turned pastry chef narratives the media likes to focus on. The questions I grapple with in my book are how do we live a richly textured life on a more modest income. Is that still possible?And how do we get our brains around, confront, deal with the downward mobility many of us are facing and never expected. Liz! So happy to see you’ve joined this WOW conversation. If WOW readers wish to contact you directly, may they do so (at your fakingnormal e-mail address above)? Maybe you have another, similar, book in your future, but this next one could be on older, single, retired women — of whom there are many here in San Miguel. Yes, Bonnie…WOW readers can reach me at fakingnormal@yahoo.com. Thank you again for your support. Wonderful, Liz. And it’s my pleasure to support your inspired efforts to help others through your new book.